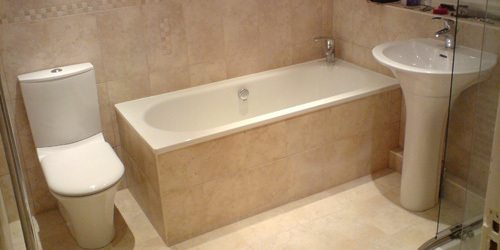 We specialise in: Plastering / Skimming, Tiling, Floors, Bathrooms, Cloakrooms, Kitchens, Repairs and Alterations. At DCL Plaster & Tile we specialise in: Bathrooms, Kitchens, Cloakrooms, Floors, Plastering / Tiling, Skimming, Repairs and Alterations. We are based in Kent and cover a wide geographical area extending to and including: Dartford, Gravesend, Gillingham, Maidstone, Tunbridge Wells, East Grinstead, Caterham and Bromley. Samples of our work are shown in the Portfiolio. To see area of coverage map & to contact us please Click here. DCL Plaster & Tile is dedicated to providing a professional, honest and reliable service to clients throughout Kent and the surrounding areas. With a focus on customer satisfaction we can boast an expanding client base in both the domestic and commercial sectors. DCL Plaster and Tile, N'appelle, Rushmore Hill, Knockholt, Kent, TN14 7NS.